We dive deep into AMD's Radeon VII and the overall state of graphics cards. Buckle up. 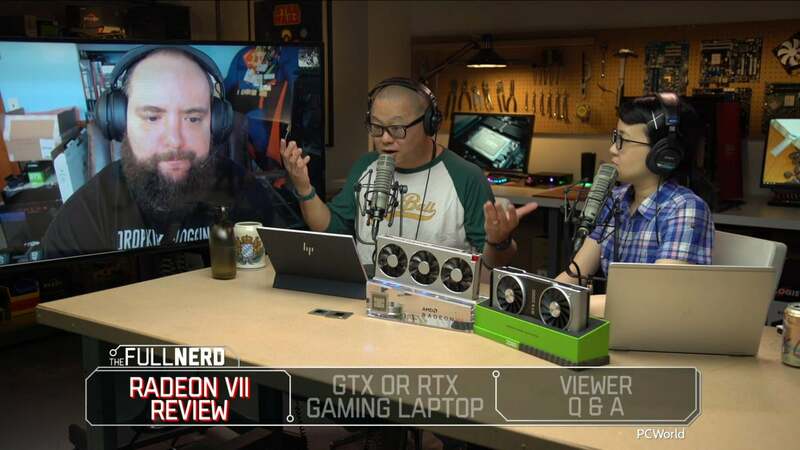 In this episode of the Full Nerd, Gordon Mah Ung, Brad Chacos, Alaina Yee, and Adam Patrick Murray review AMD’s enthusiast-grade Radeon VII, before the discussion wanders to all things graphics cards. This one goes long! We kick things off with our Radeon VII review, and there’s a lot to talk about. AMD’s return to high-end 4K gaming is the first-ever 7nm GPU for consumers, rivalling Nvidia’s GeForce RTX 2080 in raw frame rates—but there’s so much more than that. Radeon VII comes loaded with 16GB of cutting-edge HBM2 memory for a blistering 1TBps of overall bandwidth, and this card absolutely screams in content creation tasks. The gang wades through it all…and bemoans how 4K gaming has been stuck at the same price and performance level for roughly two years now. After that, we dive into whether you should buy one of those snazzy new GeForce RTX-equipped gaming laptops like the spectacular MSI GS75 Stealth or hold out for rock-bottom deals on notebooks packing GTX 10-series GPUs. Opinions differ. Finally, we wrap things up with an extended Q&A session with our live viewers and Full Nerd Discord members. Surprise! It’s loaded with graphics card questions. You can witness it all in the video embedded above. You can also watch The Full Nerd episode 84 on YouTube (subscribe to the channel while you’re there!) or listen to it on Soundcloud if you prefer the audio alone. Have a PC- or gaming-related question? Email thefullnerd@pcworld.com and we’ll try to answer it in the next episode. Be sure to follow PCWorld on Facebook, YouTube, and Twitch to watch future episodes live and pick our brains in real time! This story, "The Full Nerd ep. 84: Radeon VII review, GTX vs. RTX laptops, and GPU talk galore" was originally published by PCWorld.